Stuttgart. Like no other vehicle, the 911 unites such seeming contradictions as sportiness and everyday usability, having stood for sheer driving pleasure for 50 years now – and not just when the sky is blue and the sun is shining but also in winter driving conditions. 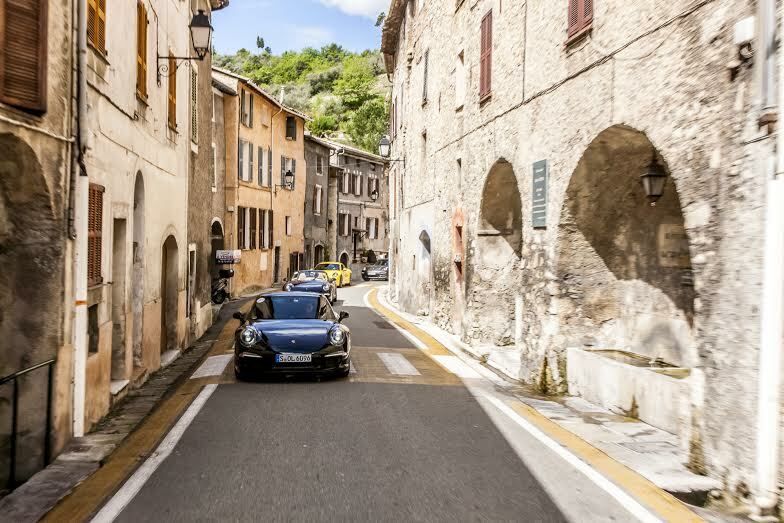 Against this backdrop, it doesn’t come as much of a surprise that there are numerous Porsche customers in regions in which winter is the rule during most of the year. The northernmost Porsche Centre in the world, for instance, is located in Tromso, Norway: there are loyal 911 drivers even at the Arctic Circle. In fact, in Norway alone, there are four more Porsche Centres; in Sweden are six and in Finland are three Porsche Centres available to customers. 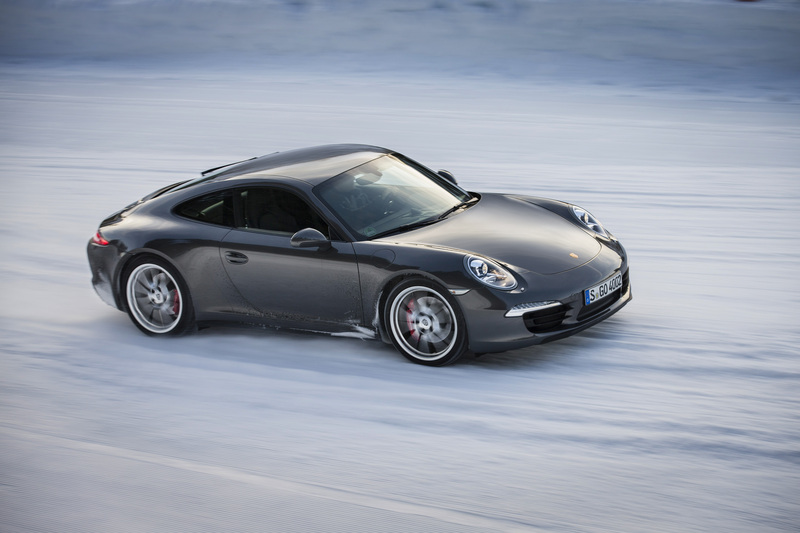 Many 911 customers enjoy driving in snow and ice also in Alpine countries like Switzerland: vehicle sales have been growing there year after year. Alongside the Cayenne, the sports car icon is the most successful model in Switzerland. Last year alone, 656 vehicles were delivered to customers there. And the 911 is popular in Switzerland not only as a coupé. Cabriolets accounted for 42% of the 911 sports cars delivered in 2012. No wonder: Even in cold temperatures, the driver of a 911 Carrera Cabriolet enjoys a climate comfort coming closer to that of a coupé than ever before. 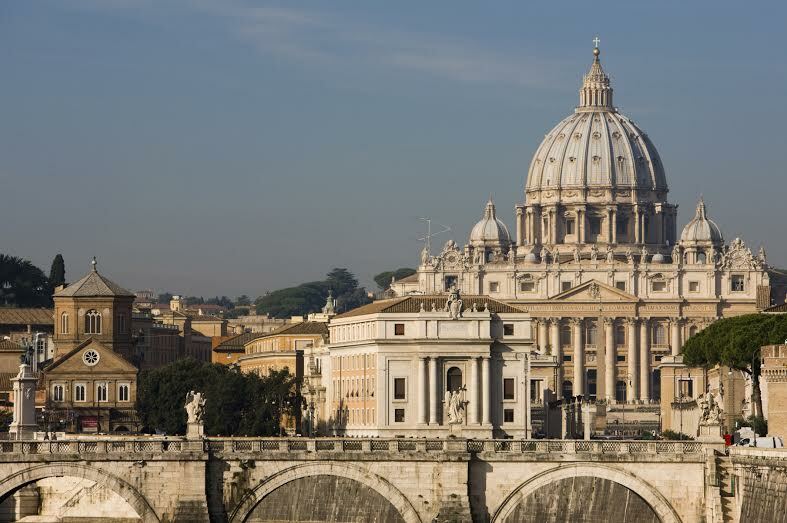 Thus, for instance, the external material is lined in its entirety by an insulating mat. The lateral parts are also completely covered with material so no technical components are visible any more when the top is closed. 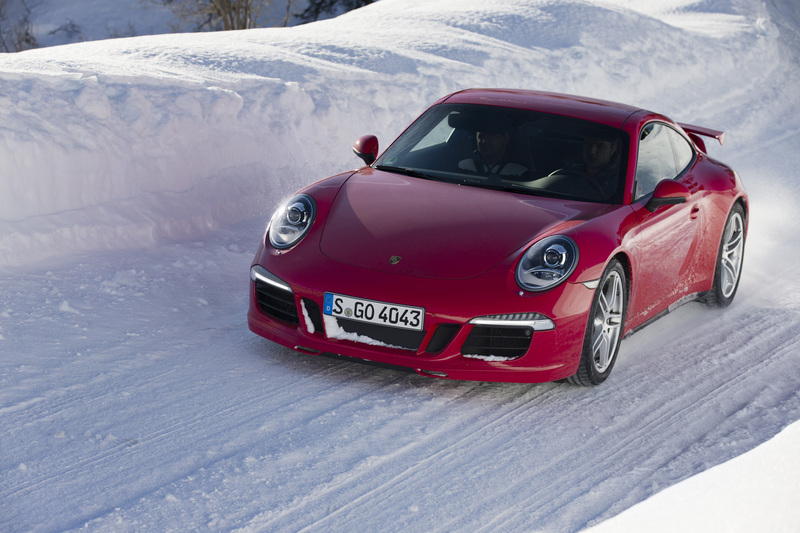 The 911 with all-wheel drive, in particular, is ideal for driving in winter. 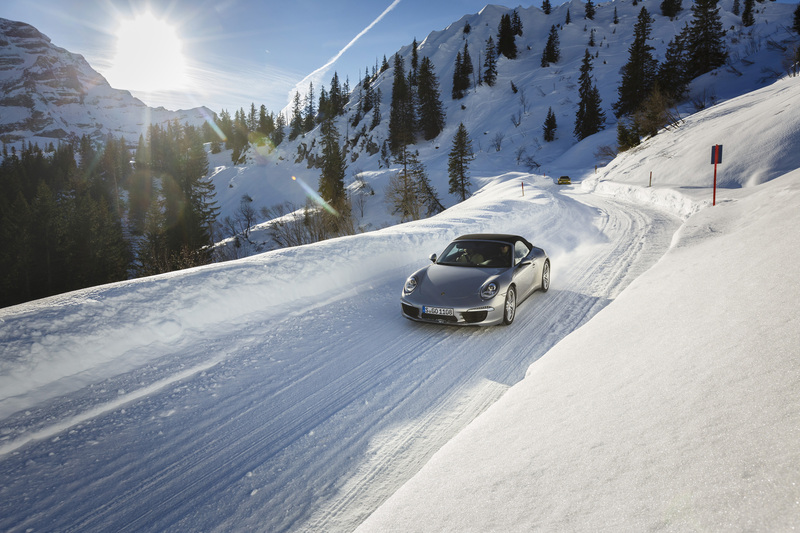 The Porsche Traction Management (PTM) translates the great driving-performance potential optimally in all weather conditions. Within a split second, the optimum power distribution between front and rear axle can be controlled via a multi-plate clutch. Depending on the driving situation, this means more driving stability, a more agile handling and outstanding traction even on slippery road surfaces. In short: Even more driving fun with more safety, especially on snow and icy roads. Because that’s where the premium on traction really shows its stuff. “For me, the Carrera with all-wheel drive is the perfect everyday car. Thanks to its technology, it is safe for active driving on ice and snow; on the other hand, it always offers the self-assurance of a thoroughbred sports car. Owing to its excellent all-round visibility and the storage space behind the front seats, the car is very suitable for the city and for shopping as well,” says Walter Röhrl, twice holder of the rally world championship. 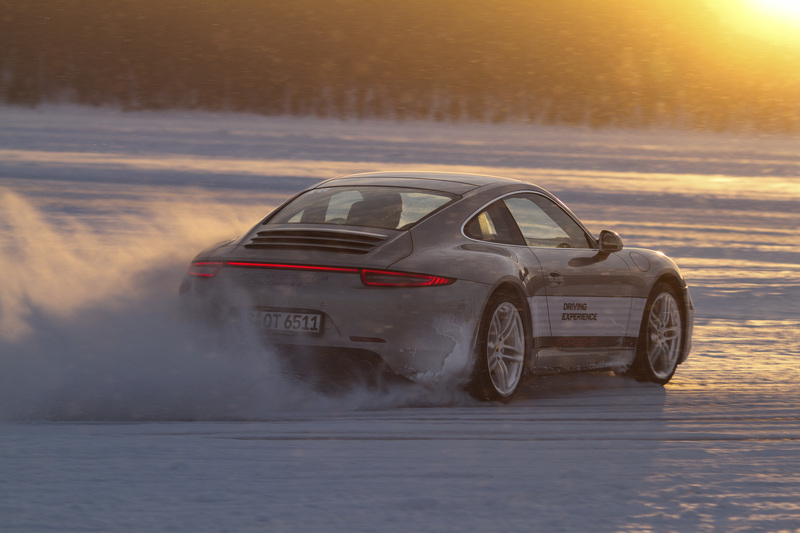 Porsche enthusiasts can also satisfy their curiosity about the advantages of the 911 Carrera by selecting from the various courses and sessions of Porsche Driving Experience: At two training sites in Finland’s far north 1,350 drivers will have the opportunity to test the Porsche 911 at first hand in extreme weather conditions this winter. Beginners and advanced drivers will have the chance to expand their driving skills under the guidance of Porsche instructors and learn to control their car even better in three training steps that build on one another. On snowbound tracks and ice lakes at temperatures up to minus 30° Celsius. The rear-focused design of the all-wheel drive, typical for Porsche, offers optimal support. 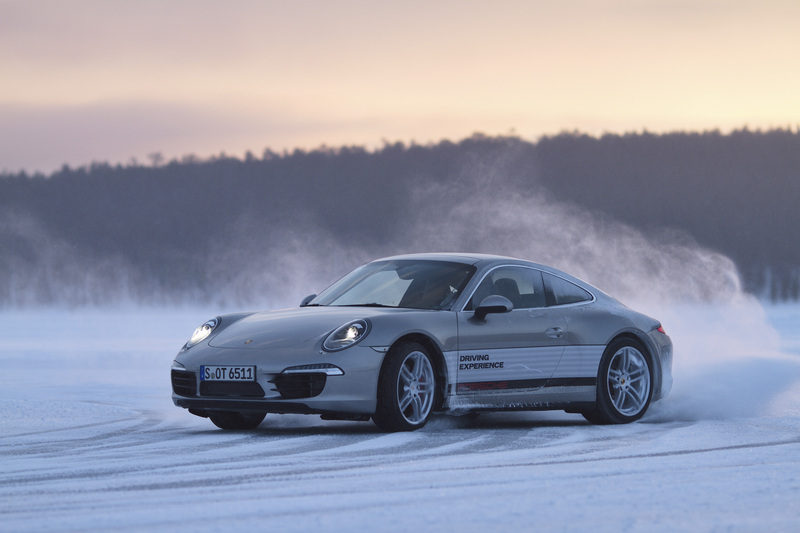 You will find the dates and other information on all winter offers of Porsche Driving Experience on the Internet at: http://www.porsche.de/driving-experience-winter/. Norway‘s North Cape is one of the most northerly points in Europe. When the time was right, Classic Driver Frank Strothe checked the battery and alternator of his 1966 Porsche 911 (shod with studded winter tyres), stuffed a sleeping bag and other essentials under the ‘bonnet’ and set off. I’ve always wanted to go to the ‘Nordkapp’, writes Frank Strothe. I’ve been before, in the summer, but there was no challenge in it. So for years I’ve pondered a winter expedition; driving in the snow is more fun, especially in a classic car that relies on your driving skill to keep it on the road, rather than a host of electronic safety measures. In Finnmark – Norway’s northernmost county – mothers use run-of-the-mill hatchbacks to take their children to school in -40deg temperatures. So to make the trip worthwhile I needed a slightly more adventurous ride: what better choice than an original, unrestored Porsche 911? I was given various tips on how to make sure the first leg of my journey wasn’t to be my last. Recommended equipment included a portable heater, a satellite phone, auxiliary fuel tank, additional lights and a crash course in basic mechanics. Perhaps a little naively, I ignored them all. I wanted a ‘pure’ experience, so I checked the battery and alternator, fitted spiked winter tyres and packed a sleeping bag and tent into the front luggage compartment. No more messing around, it was time to get going. I trailered the 911 from Germany with – what else? – a modern Land Rover Discovery. From Kramfors onwards I left my fate to the old Porsche, which I drove to Rovaniemi for the first night. 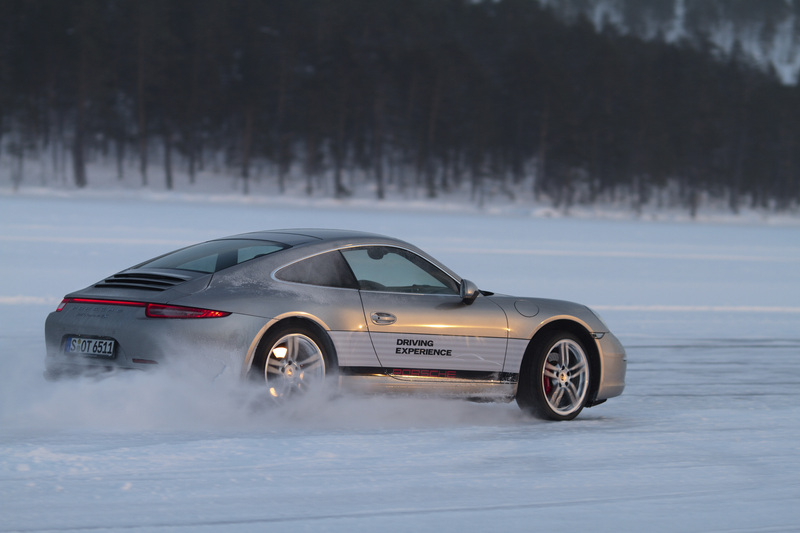 Next day, the goal was to reach Ivalo where my reward would be a session at the Porsche Driving Experience, to drive some of my car’s descendents on a frozen lake. It was very impressive, but, when dusk settled, I was glad to return to the wheel of my classic 911. The next morning, I attempted to make the short trip from the old fishing village of Gjesvær to the North Cape. However, progress was halted by an oversight in my journey planning. Due to crossing a time zone, and the ban on covering the last few kilometres to the Cape alone, I had to wait an hour to join a twice-daily convoy. Our cavalcade was a rather small one as it turned out. Led by a listless snowplough, it was just a BMW X6 with Russian plates and my 911 bringing up the rear – probably one of the most diverse trio of vehicles I’ll ever belong to. Since it was so deserted that day, I had ample time to photograph the car next to The Globe, the North Cape’s landmark monument. During one refuelling stop, I noticed the tyre pressures were a little low. I corrected them and went on my way, only to spin the car while pulling out of the petrol station (much to the amusement of a bus full of German tourists). I made my getaway, ego somewhat damaged, and again began to enjoy the sprawling, empty road ahead. By this point I had covered over 2,000km in snowy and icy conditions and had become accustomed to them, happily wagging the 911’s tail through corners. Unfortunately, another dramatic spin soon left us both in deep snow, the 911 truly beached. It turned out that the air pressure gauge at the petrol station was wrongly calibrated: each tyre had been overinflated, so the spikes were no longer effective on the ballooning tyres. A friendly group of Norwegians came to my rescue – but not before the return of the holidaying Germans who had another chuckle at my expense. Apart from that, and a spell where the alternator threw a wobbly for a few hours, the 911 was very well behaved. It even played saviour when I returned to the Land Rover at the end of the trip, as the Discovery’s battery had drained away. In total, I travelled 6,000km in six days, and pretty well loved every minute. 1966 Porsche 911 SWB, with the carburettor trumpets partially taped-over to prevent them icing up. The only other modifications were the studded winter tyres. The car is unrestored and totally original. Be careful. You should always carry enough in the car to survive a night outside at -40deg: an Arctic sleeping bag, a tent (or, at a push, you could sleep in the car), a down jacket, thermal trousers, thick gloves, a hat and plenty of food. I didn’t, but you should really take snow chains for emergencies. Fill up whenever the tank is half full. The 911’s heater will not work properly below -20deg. So, while driving, I wore ski pants, a Polar anorak, thick mittens, a hat, and hiking boots. And still froze.